It seems that everyone agrees Peter Jackson has gone off the rails. His Hobbit is a mess as his Lord of the Rings is a masterpiece. This week-end I watched the latter, a marathon I hadn’t done since 2004. I’m pleased to say the trilogy holds up superbly. Especially since I improved on it by removing scenes I can’t stand, thanks to special software. Now The Lord of the Rings is truly perfect. Here is the list of all the scenes I cut. The three extended DVD versions have a total running time of about 11 hours. My special cut runs about 10 hours (9 hrs 56 minutes), which means I ended up axing about 10% of Jackson’s story. If you have the software for it, I encourage you to make your own special version of the films. It’s such a treat to watch The Lord of the Rings without being able to complain about the worst scenes that make you curse at the screen. Concerning Hobbits. I used to love this extended scene. Ten years later I now see that it fails on every level. (1) It’s effectively a second prologue, voiced-over by Bilbo, on top of the excellent prologue narrated by Galadriel. (2) It commits the sin of explaining, not showing; we see plenty of hobbit culture at Bilbo’s birthday party and the Green Dragon that we don’t need it explained to us. (3) It rudely jerks us back and forth between Bilbo (in his study at Bag End) and Frodo (in the wagon with Gandalf), which makes for a poor introduction to them both, dividing our interest. (4) Indeed, Bilbo opening his front door to Gandalf is his perfect first scene. If you think you like the Concerning Hobbits prologue, I encourage you to dig out your theatrical version and play it; it’s the much stronger and better introduction to Frodo and Bilbo. The Doors of Moria. There’s a story to this one. On the day before The Fellowship of the Ring was released in the theaters, I was certain I would hate it. But I was trying to get in the spirit and be a good sport, and when a co-worker asked me what part of the movie I was looking most forward to, I said (somewhat sarcastically) the part where Gandalf threatens to knock on the doors of Moria with Pippin Took’s head. Of course, by the time I got to Moria I was in love with the film after all, but still disappointed that my favorite line didn’t make it. To add insult to injury, Jackson further reduced Gandalf by having Frodo solve the door riddle for him. I removed this from my special cut. And since the extended version has the Pippin line I wanted, all is now perfect. The Osgiliath Detour. I love Jackson’s Faramir. He’s a darker character than Tolkien’s, tempted by the Ring as he should be, and much more believable. The “Clockwork Orange” scene at the Forbidden Pool (Gollum getting beaten to a pulp) is one of my favorites. But I hate the detour to Osgiliath more than any scene in the trilogy. Faramir should have let the hobbits go when Sam explodes at him. That’s where I made my special cut, right before Faramir can say, “The Ring will go to Gondor.” In my version of The Two Towers, Frodo and Sam do not reappear until the epilogue in the forest. The Osgiliath scene is actually a disaster in every way. The Nazgul that confronts Frodo is poorly used. Frodo’s attack on Sam is unconvincing. Worst is Sam’s monologue, cribbed from the Stairs of Cirith Ungol in the book, about the “tales that really matter”. It’s one of my favorite Tolkien passages, in which Sam reminds Frodo about the great heroes of Middle-Earth who “had many chances of turning back, but went on, and not all to a good end”. Jackson rewrites the pessimism in favor of crass cliches; now those great heroes kept going, not despite the hopelessness of their cause, but rather the opposite: “because they were holding onto the good in this world worth fighting for”. Having Faramir recant and let the hobbits go after this cheesy line makes it twice as awful. There are also lame scenes prior to the battle filled with corny dialogue. I removed them all. One such scene is Legolas and Aragorn’s shouting match over the way they are outnumbered. Another is when Aragorn tells the young Haleth that “there is always hope”. Always hope? The idea that hope springs eternal is an alien intrusion in Middle Earth. The Aragorn of the books said things like, “We must do without hope, and at least be avenged.” (After leaving Moria.) See also my comments about the Osgiliath scene above. In the end, my version of Helm’s Deep is far shorter and much more impressive. Pippin Manipulates Treebeard. Let me be clear: I love the fact that the ents act like Switzerland and first decide not to get involved against Saruman. I also approve the way Treebeard reverses the democratic entmoot decision like a tyrant, when he sees the tree massacre and flies into a rage. I consider all of this an improvement on Tolkien. However, I do not like how Pippin engineered Treebeard’s discovery of the clearcut. This is the same problem I had with Frodo solving the riddle at the doors of Moria. I understand that Jackson wanted to give the hobbits more proactive roles, but making them clever at the expense of immortals like Gandalf and Treebeard are cheap Hollywood maneuvers. So I cut the scene — a truly stupid and ridiculous one — where Pippin suddenly tells Treebeard, in a very conniving fashion, to go south, as if Pippin would know the precise location of a tree massacre but Treebeard would not. The result is that in my cut, Treebeard stumbles on the tree slaughter by accident, and in that scene I removed Pippin’s condescending “I’m sorry, Treebeard”, which implies that he regrets having to give the ent a wake-up call. Smeagol and Deagol. This scene is mostly well done, but I don’t care for it. A prologue is unnecessary in the second and third films. (Gandalf falling with the Balrog is an excellent start to The Two Towers, but that’s a flashback more than a prologue.) The Return of the King opens perfectly on Frodo and Sam waking up in Ithilien. I should also note that Gollum’s makeup job is atrocious as he evolves over the centuries. Bottom line, I removed the entire scene. We already know how Gollum began. Early extended scenes. With the exception of Saruman (criminally omitted from the theatrical version), all of the extended scenes prior to Denethor entering his pyre chamber are either silly or superfluous. They bog down the pace at points when things are supposed to moving quickly, and some of the levity (used so well in extended scenes of Fellowship of the Ring and Two Towers) clash with an increasing dark tone. So from the point of Saruman’s death up to that of Denethor marching into his death chamber, I simply use the theatrical cut of the film. Thus in my version, there is no drinking game between Legolas and Gimli. Merry does not kneel before Theoden. (A poorly handled scene, unlike Pippin’s oath to Denethor: Merry acts like a giggling school girl with no dignity whatsoever. Also, there’s not even the payoff we get in the book, when Merry speaks to the dying Theoden on the Pelennor Fields; Jackson wisely chose Eowyn instead.) Pippin does not speak words of encouragement to Faramir, which somehow ring hollow. Sam does not encourage Frodo with “There and Back Again” optimism near the cross-roads, which contradicts his more realistic outlook in the book (on which point see my criticism of his Osgiliath monologue in The Two Towers). Merry doesn’t have the uninspired dialogue with Eowyn en route to Minas Tirith. 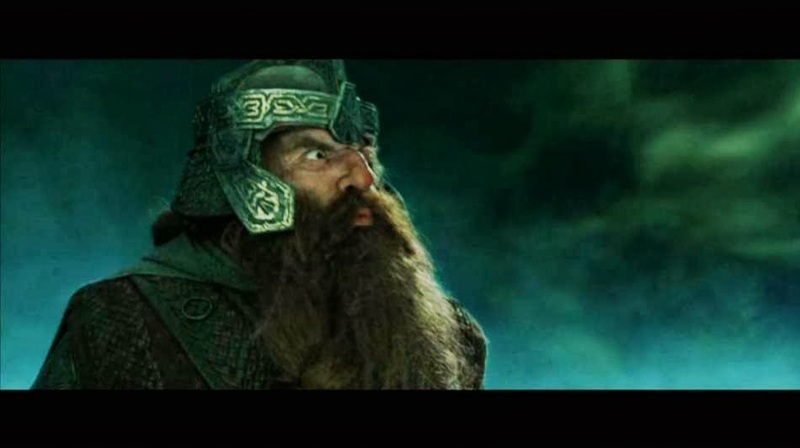 Most importantly, Gimli does not act like a clown on the Paths of the Dead, and he certainly does not blow ghosts away from him with his goddamn breath — a truly outrageous scene — nor do we get the cheesy avalanche of skulls. After the point of Denethor’s entry into the pyre room, however, the extended scenes are all excellent. Denethor gets in his best line from the book: “You may triumph on the field of battle for a day, but against the power that has arisen in the east there is no victory.” Gandalf confronts the Witch-King, who shatters his staff. Eowyn does battle with the Orc leader Gothmog. Eomer grieves in rage on the Pelennor Fields. It takes Pippin a long time to find Merry wounded on the battlefields — well into evening. We get the Houses of the Healing. There are two important scenes in Mordor, with Frodo and Sam joining the orc army, and the especially moving one of Sam seeing the star, when Frodo is at death’s door. And finally there is The Mouth of Sauron at the Black Gate. Naturally, I retain all of these. Ninja Legolas. His oliphaunt acrobatics put a stain on an otherwise perfect battle where you feel the heavy realism of war on both sides. Suddenly with Legolas, we’re out of Braveheart and into Crouching Tiger Hidden Dragon (a film I deplore). Legolas has cheesy stunts elsewhere (like the shield-surfing at Helm’s Deep, which I also removed), but at least they’re usually brief. His oliphaunt stunt goes on forever. Not in my version. Gone. Indiana Eowyn. Eowyn’s oliphaunt maneuvers aren’t as offensive as Legolas’, but they’re silly nonetheless and there’s no reason to keep them. Besides which, the extended version gives Eowyn and Merry more battle scenes — better and more believable ones than the Indiana-Jones like ride under the oliphaunt that ends with Eowyn chopping off its legs in a single stroke. A Far Green Country (Gandalf deludes Pippin). I don’t like trashing this scene, because it involves some of the best writing from the final pages of the book, and is brilliantly acted by Ian McKellan and Billy Boyd. The problem is that it’s horribly misused. Gandalf comforts Pippin with promises of a paradise he’ll never obtain. Only the elves go to Valinor. Mortals — men, dwarves, and hobbits — never get to see those “white shores and far green country under a swift sunrise”. Frodo and Bilbo were exceptions, granted them as Ringbearers. It was painful to cut this scene, because unlike Sam’s Osgiliath monologue, the transposition is well conceived. It’s an inspired scene, much like Boromir’s moment with the Ring on Mount Caradhras (a great move from Emyn Muil in the book) and Wormtongue’s creepy come-on lines to Eowyn (recreated from her description in the Houses of Healing). But I had to kill it. We can’t have Gandalf feeding poor Pippin delusions. Ducking from the Eye. This one irks me. That Frodo and Sam could hide from the Eye by “ducking” is rather silly, and it continually cuts back and forth to interrupt what’s going on at the Black Gate. Because it just looks wrong, I removed it to keep the spotlight on the approach to the gate right before the Mouth of Sauron appears. Is there any way you could share this cut? What I mean is at least share the cutting times, so I could follow your steps at have an identical cut. Thanks. I’m afraid I’ve long discarded the actual cutting times, and I regret doing so, as you’re not the first who has asked for them. Sorry! It seems like you’ve let your bias against fun and fresh movie scenes corrupt your enjoyment of the film as a whole. Why don’t you chill out a little bit and have fun with the added jokes?